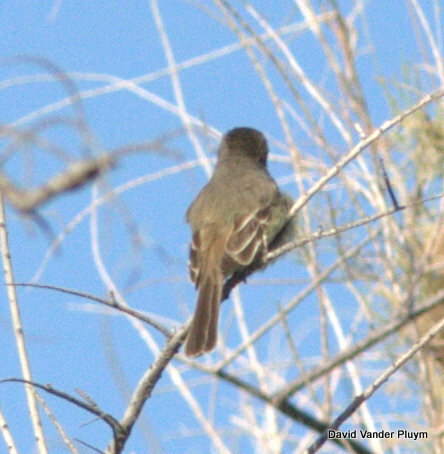 With only four previous records for the United States, Lauren Harter’s and my discovery of a Nutting’s Flycatcher in the Bill Williams River NWR in the winter of 2011-2012 was a shock, though there was a prior record (Sept 2008) for the Bill Williams. When it was rediscovered returning the next winter we were surprised but not shocked. Though there had been reports of two birds during the first year and speculations about it being the same bird as the one in 2008 it seemed like it was one bird that was wintering in the Mosquito Flats area and then leaving for the summer. This past winter, though there were reports of the bird at Mosquito Flats into March, the last fully documented report was from 10 Feb so it seemed in all likelihood that it had left. Fast forward to 8 April and we are in full work mode for GBBO doing riparian bird surveys, when Lauren Harter heard and recorded a Nutting’s Flycatcher on the north side of the Bill Williams River (North Burn) about ~1km from the Mosquito Flats (which is about how far it moved its first year). 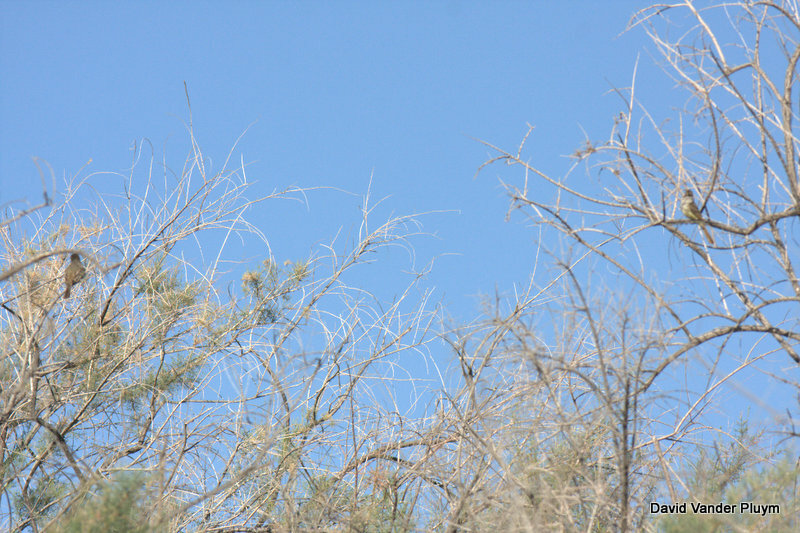 A couple days later on 11 April Oscar Johnson discovered a calling Nutting’s Flycatcher 3 km away from the previous sighting. We all assumed it was the same individual wandering around, but we questioned this assumption when Oscar had it again in the same location 16 April. The possibility exists that Oscar’s birds are different from the North Burn bird, but until we are able to get back to North Burn this can only be speculation. 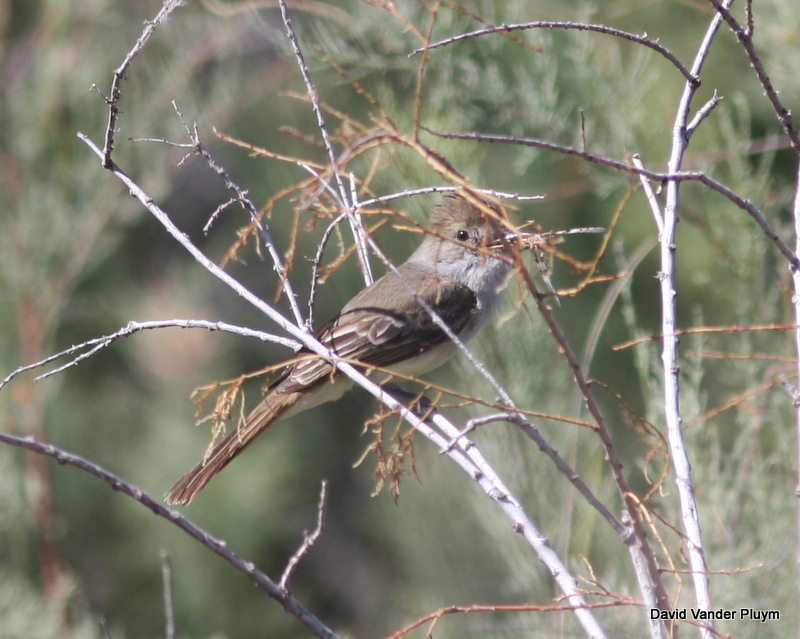 On 19 April Lauren went out to investigate what was going on and saw an adult carrying something to the same patch of tamarisk twice. This definitely got us excited, assuming the bird had a nest, but who was the mate? Both Oscar and Lauren had thought they heard and recorded two birds but were unable to confirm this. On 20 April I decided to head out and try to see if I could add another piece to the puzzle. After waiting I was able to see that the bird had a regular circuit of stops it would make. At one of the stops of the circuit a territorial dispute broke out with three birds at least one of which was a Nutting’s Flycatcher and one possibly an Ash-throated. Later in the morning I heard counter calling Nutting’s Flycatchers from the same area, all very interesting but not the hard breeding evidence I wanted. Suddenly the bird flew off the cliffside carrying something in its beak. As it flew directly to a spot I had seen it visit on several occasions I decided that I should follow! After about 100 meters of belly crawling and negotiating through mesquite and tamarisk (boy is that stuff dense!) I popped out at an opening where I suspected the birds were going. As I sat down to wait I starting hearing soft wheeping coming from a dense cluster of tamarisk. I sat and waited and soon heard soft wheeping from some dense tam and as I suspected that might be where a nest was, I investigated. As the wheeping became more agitated and as I was unable to find the bird I decided to retreat back to the opening and see if I could see anything from there. As I was backing out I flushed the bird and briefly it landed in the open where I could clearly see it was a fledgling Nutting’s Flycatcher!!!!!!! I was shocked and before I could get my camera up, the bird gave one last soft wheep, disappeared into the dense tam and stopped calling. Still shocked, I suddenly noticed an adult fly in and land, softly calling, right where the fledgling had been. I quickly grabbed my camera and got a few photos of the bird carrying an insect before it noticed me and quickly swallowed the insect. As it was starting to get warm and I found myself being a disturbance to the birds I decided to head out. I still wanted to get photos to document this first United States nesting record and confirm that the parents were both Nutting’s Flycatchers, so of course Lauren and I went out there early this morning 21 Apr, hoping to be rewarded! How quickly those rewards came! Since we had an idea of the area being used by the birds, we were able to keep a lower profile and completely avoided disturbing the birds. We soon had first one adult in the area, and based off of the feather wear of the tail, we were able to confirm it was a second bird, different from one I photographed yesterday. Soon though we had even better proof in the form of two adults sitting together on the edge of our little opening! As soon as the first adult came in, we could hear the fledgling calling from the dense tamarisk. The adults would drop down into it likely feeding the young! When the adults left we were able to quietly investigate and I quickly discovered a fledgling sitting on a branch!!! I softly got Lauren’s attention and while I was able to snap off a couple photos she was able to get recordings of the bird calling. As the calling continued we realized we could hear a second youngster as well and were even able to get a quick look at it! After a passing Lucy’s Warbler startled one into moving away from us and a parent arriving with food beckoned the youngins deeper into the tamarisk, we decided to head out, fully satisfied with our day. We did try to get over to the North Burn area, but gave up after finding the “shortcut” trail overgrown and under water and the day getting late. Will have to check another time when our busy schedule allows. Given that this a first breeding record for the United States, the three of us plan on submitting a manuscript for publication! Lauren was able to get several recordings today and on the 19th of these birds. Below are links to the recordings in xeno-canto, with descriptions of the different calls and timestamps. Enjoy! April 19, single adult calling: here and here.April 21, interaction calls of two adults: here and here. Adults and fledglings here; a similar recording here but with probable begging calls. Perhaps the best one is here, with all four individuals calling together. Be sure and check out all of these recordings. 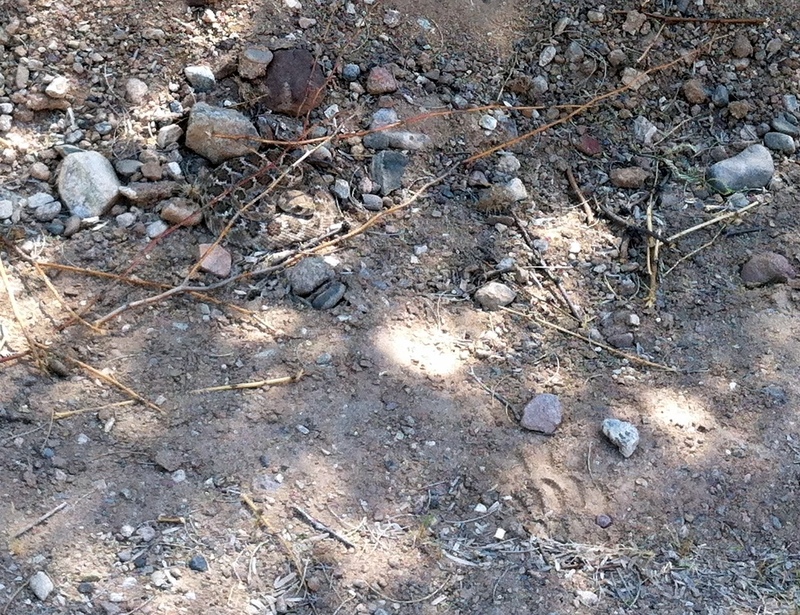 As if the day’s excitement wasn’t enough, just before I arrived at the car I had a nice reminder that rattlesnakes don’t want to bite you if they don’t have to, after I put my foot down a foot from a coiled one! Edited 24 Apr: slight change to the wording to better clarify the events of 20 Apr. 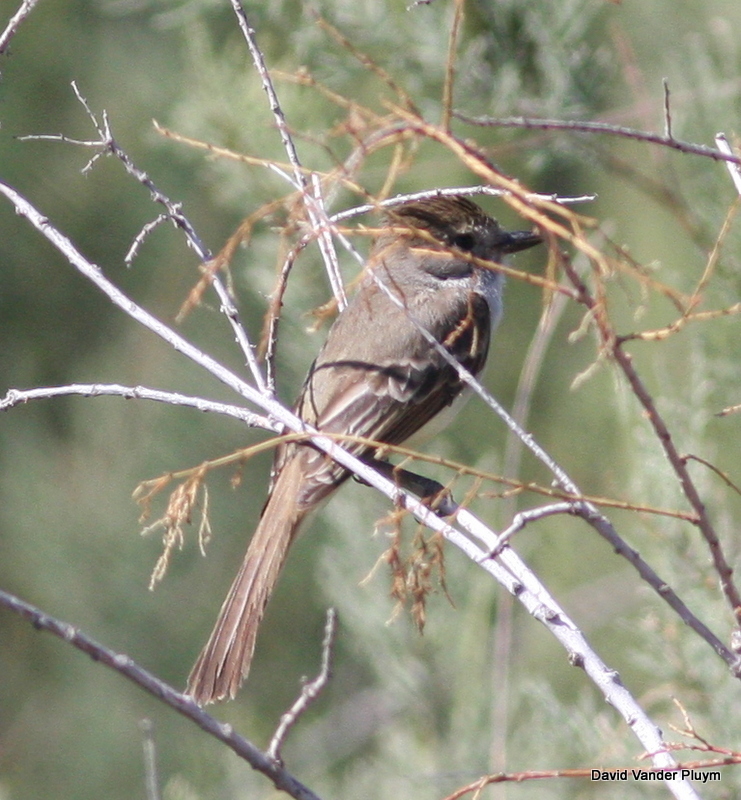 This entry was posted in Bill Williams, LCRV, Mohave County, Vagrants and tagged LCRV, Mosquito Flats, Nutting's Flycatcher, Nutting's Flycatcher breeding. Bookmark the permalink. 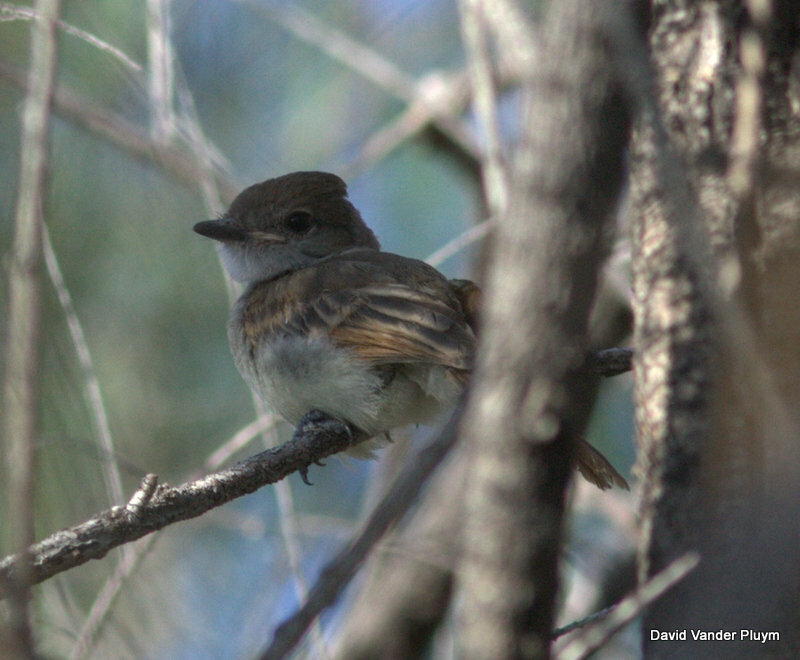 21 Responses to Nutting’s Flycatcher Confirmed Breeding! Awesome find and extremely great field work by both you and Lauren on this fantastic discovery! What a fantastic discovery! The patience exhibited by both of you in your efforts to confirm breeding by Nutting’s Flycatcher in Arizona is truly inspiring. Kudos!! Awesome job guys. Ye both shall be famous for 1st US breeding NUFL forever!!! Awesome stuff, too awesome to even fully appreciate at first hearing. Great work Y’all! Get National Geographic on the line for a documentary. Wow. That’s pretty fantastic! Congrats! Excellent work, wonderful discovery!! It’s great to see this first thing in the morning. Wow!! Huge congrats and what a great job!! Congratulations on finding them breeding up here. So proud of your accomplishment. Holy cow! Well done indeed. So there’s one NUFL that makes a circuit. Along the way, it interacts with several other Myiarchus, one of which is also a NUFL. That’s two birds. Then it has a mate, which is three birds. Then it’s counter-calling with more NUFLs, so we’re up to four birds. Then there’s one some kilometers away….which is five birds. How many of these are there along the Colorado River? Sorry for the confusion each of those was a separate incident and not all at the same time. So first there was a territorial dispute (involving at least one of the pair) and then later I had counter calling all of this was within the same 300 meter area and were with the same birds. So two adults in this area and at least two fledglings. The bird some kilometers away might be a different individual, but as of now we can’t be 100% sure it was a different bird. I looked for it today without luck. Cool, thanks for the clarification! Definitely some super-excellent findings. Also, I wish the ABA blog had featured this post. This is major news, way more interesting than Lynn Barber droning on about her big year experiences. Great job Dave, Lauren and Oscar….next task is to get a count of the population in the Bill Williiams…what an odd concept to consider! The tenacity you and Laurens exhibit have given this biologist a chance to live vicariously. The scientific and emotional input are greatly appreciated and as a birder I especially LOVE the sound recordings and details the most! You are doing a wonderful job documenting data which might even transfer into the political arena (i.e. climate change). Keep up the excellent endeavors. This is surely supreme birding at its finest! A top notch, unprecidented discovery opening up an entirely new perspective on the distribution of this species in the US. You wouldn’t get many to crawl on their stomach for 100 yards in rattlesnake country – me included. Again, you guys continue to impress with the discoveries you’re making in your region. Amazing discovery; very proud of you guys! What are the theories on how at least 3 adults arrived in the Bill Williams? 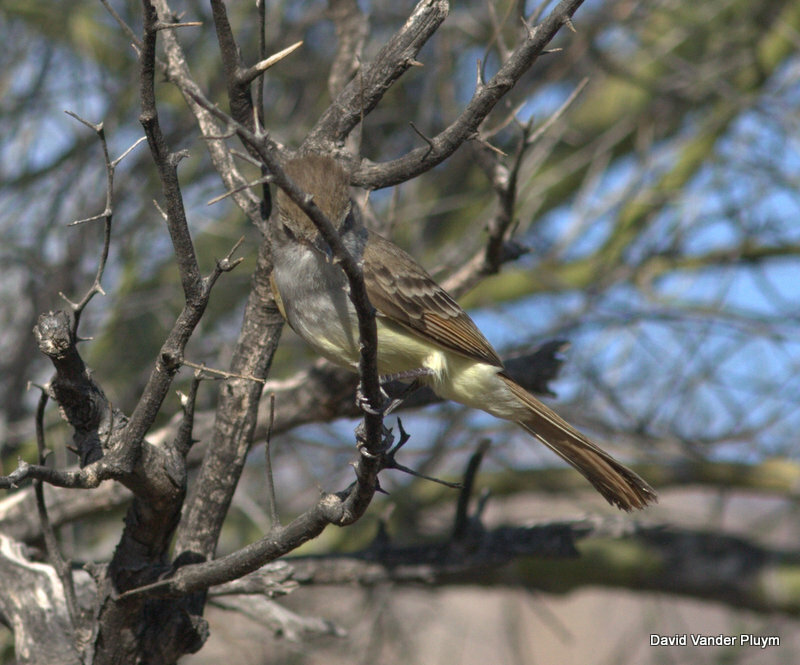 Makes one wonder how many Nutting’s Flycatchers go unobserved in the southwest if a lone vagrant can find a mate! As stated by everyone above, great discovery. Has a range expansion taken place if the young find mates as well?